If you're really fond of eggs, then you need not worry about relishing one too many. An egg a day's contribution to the risk of coronary heart disease (CHD) in healthy adults is just one percent, according to a new study funded by an industry body. Poor diet, smoking, obesity and physical inactivity contribute a whopping 30-40 percent to heart disease risk, depending on gender. The study, funded by the Egg Nutrition Centre and published online in Risk Analysis, substantiates decades of research challenging the myth that the cholesterol in eggs is linked to increased heart disease risk. This study adds to more than 30 years of research showing that healthy adults can eat eggs without significantly affecting their risk of heart disease. Moreover, the study authors noted that their analysis did not adjust for the health promoting benefits of eggs which may, in fact, decrease heart disease risk. For example, research has found that overweight men who eat eggs while on a carbohydrate-restricted diet have a significant increase in their HDL levels ("good" cholesterol) compared to men who do not eat eggs. In a recent study, eating two eggs for breakfast, as part of a reduced-calorie diet, helped overweight or obese adults lose 65 percent more weight and reduce their body mass index (BMIs) by 61 percent more than those eating a bagel breakfast of equal calories. The study evaluated the risk of heart disease associated with egg consumption, compared to modifiable lifestyle risk factors like smoking, poor diet, being overweight or obese, and physical inactivity. The authors used data from the 1999-2000 and 2001-2001 National Health and Nutrition Examination Surveys (NHANES) to categorise the US adult population into various groups based on modifiable lifestyle risks. These populations account for 85 percent of all US males aged 25 and older and 86 percent of US females ages 25 and older. 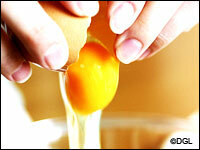 The study found that the consumption of one egg per day contributes less than one percent of heart disease risk. Unavoidable risk factors like genetics and treatable risk factors like hypertension and diabetes accounted for 60 to 70 percent. According to the authors, the NHANES data show that very few Americans are leading lifestyles that may reduce the risk of heart disease: only three percent males and six percent of females have none of the modifiable lifestyle risk factors that were investigated. In addition, the study found no significant differences between the HDL and LDL cholesterol levels of the egg and bagel eaters. Eggs are an excellent source of choline. A 2008 study concluded that a diet rich in choline and betaine, a nutrient related to choline, is associated with lower concentrations of homocysteine in the blood. High blood levels of homocysteine are indicative of chronic inflammation, which has been associated with cardiovascular disease, Alzheimer's and dementia. Eggs offer a number of beneficial nutrients. One egg has 13 essential vitamins and minerals and is an excellent source of choline and selenium and a good source of high-quality protein, vitamin B12, phosphorus and riboflavin. Besides providing one of the most affordable sources of all-natural, high-quality protein, eggs provide a valuable source of energy and help maintain and build the muscle tissue needed for strength.